Library history in Ware began in 1824 when the Mechanics and Manufacturers Library was organized. In 1861, the books were placed in the care of the Ware Natural History Society. The Young Men’s Debating Society was organized in 1871. A year later it opened a room to the public in the Sandford’s Block with 700 volumes acquired from the Ware Natural History Society. 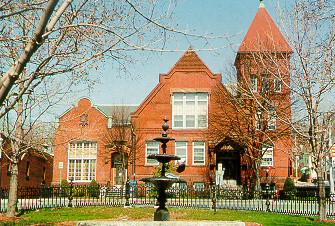 The Young Men’s Debating Society presented a petition to the Massachusetts Legislature in 1872, applying for a special act of incorporation which would allow the town to appropriate money in support of a free library for residents, still allowing the facility to remain under the management of the Society. Instead of becoming a special act, this legislation became a general law that applied to all the towns throughout the commonwealth. The law went into effect on April 17, 1872. The Society was among the first to take advantage of the new law, and it re-organized under the corporate name of the Young Men’s Library Association. No, the building was never used as a church. Our library was designed by E. C. Gardner of Springfield and represents a combination of Ruskinian Gothic and Old English styles of architecture. Mr. Gardner was also responsible for the structure located next door to the library at 2 Church Street, which was originally used as the East Congregational Church and was built in the same year. The red brick exterior is trimmed with Portland brown stone, Longmeadow free stone, and Philadelphia moulded brick. The steps and buttresses are Fitzwilliam granite. The original interior woodwork is of brown ash. Calvin Hitchcock donated the land for the library in 1879. The Honorable William Hyde contributed $10,000, and the building was erected. It was dedicated on July 19, 1881. In 1922, J. H. Grenville Gilbert bought the lot to the west of the library and a drug store was removed from that property. He gave the site to the library association. The resulting addition was built to blend in with the existing library. It opened to the public on January 19, 1924, and still serves as the reading and reference room. Additional renovations occurred in 1969, when an office, rest room, and stairs were installed. The upstairs gallery housing non-fiction books was added and dedicated on October 14, 1973. An elevator was added in 2000.